. Chapter 1. 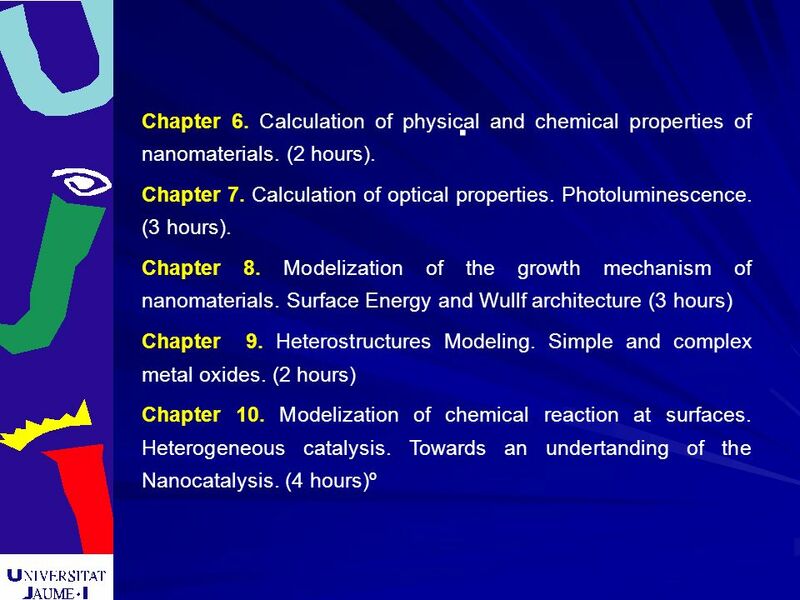 Introduction, perspectives, and aims. 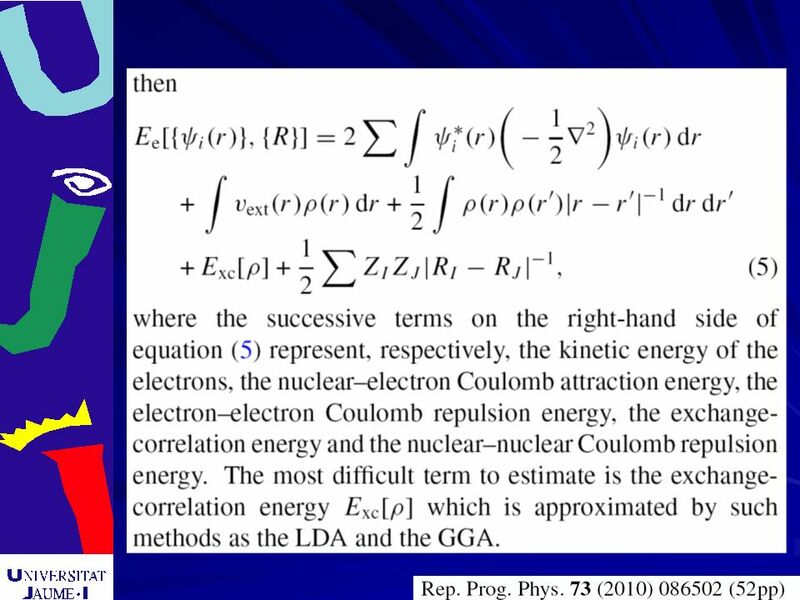 On the science of simulation and modelling. 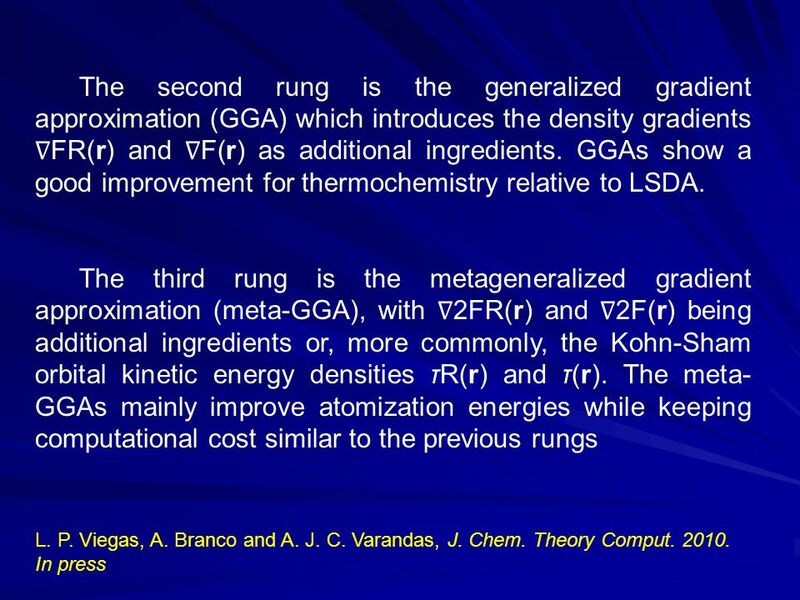 Modelling at bulk, meso, and nano scale. (2 hours). Chapter. 1 . Chapter 1. 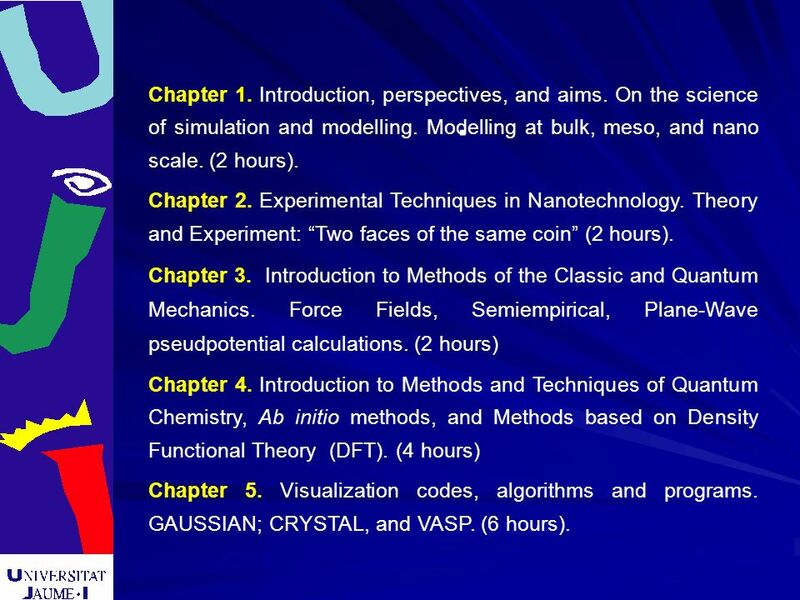 Introduction, perspectives, and aims. 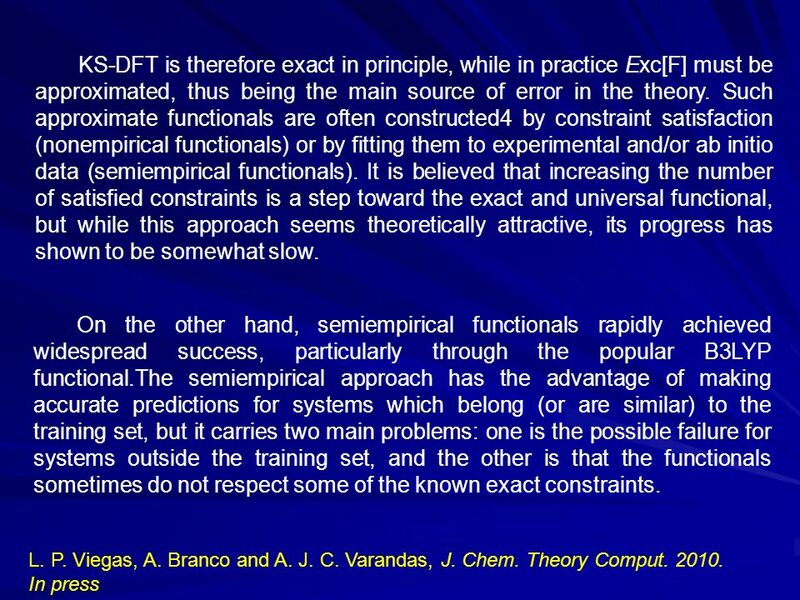 On the science of simulation and modelling. 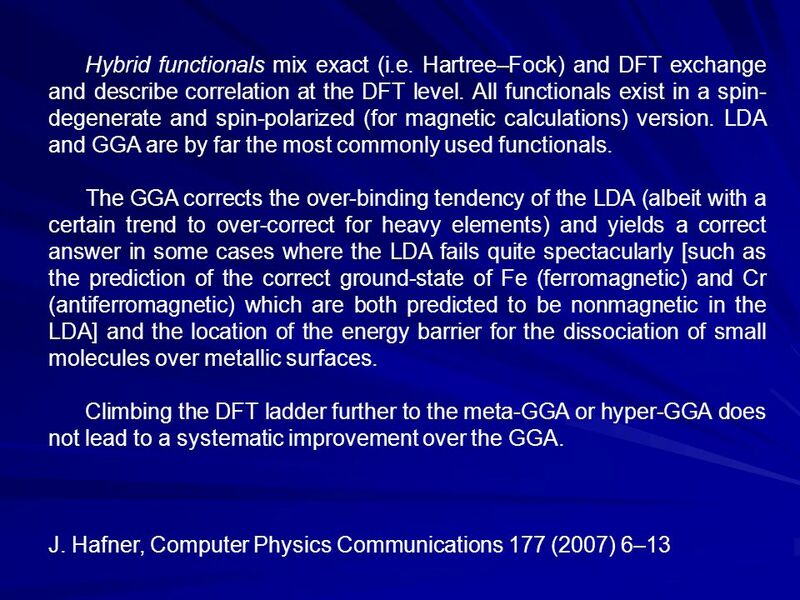 Modelling at bulk, meso, and nano scale. (2 hours). Chapter 2. 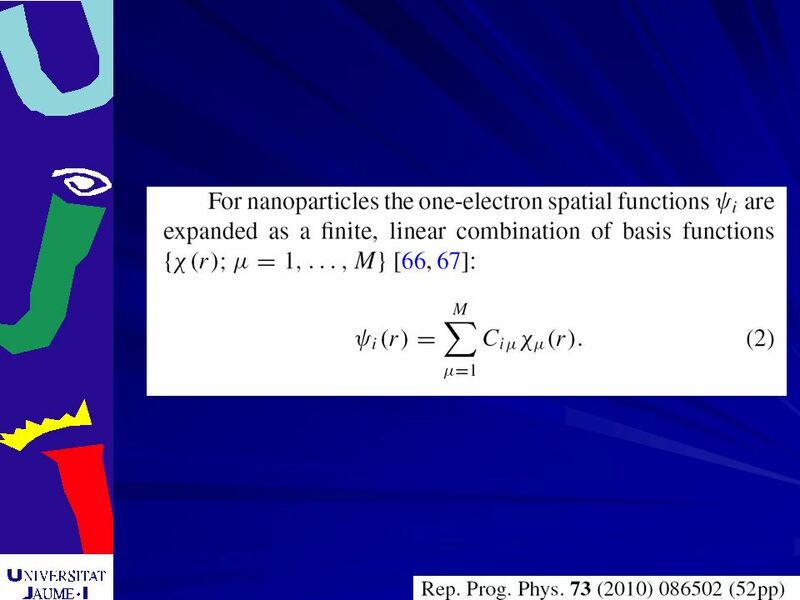 Experimental Techniques in Nanotechnology. Theory and Experiment: Two faces of the same coin (2 hours). Chapter 3. 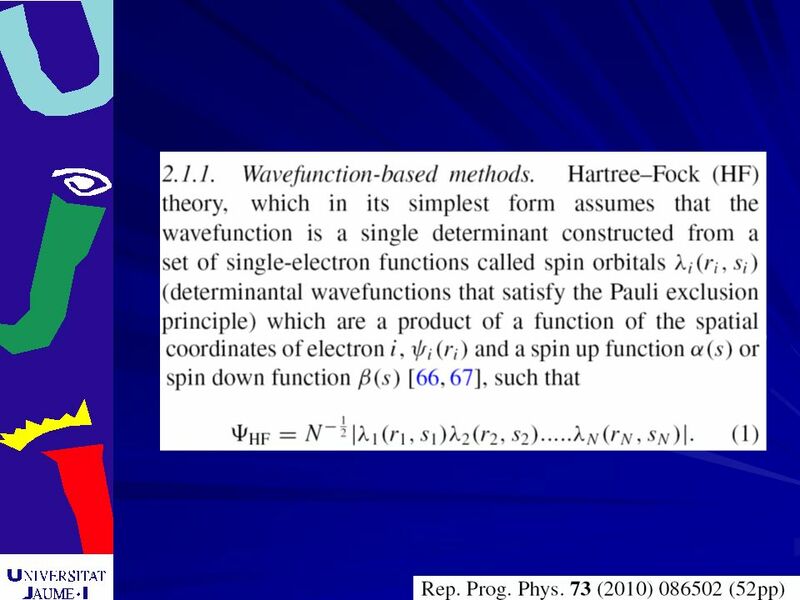 Introduction to Methods of the Classic and Quantum Mechanics. 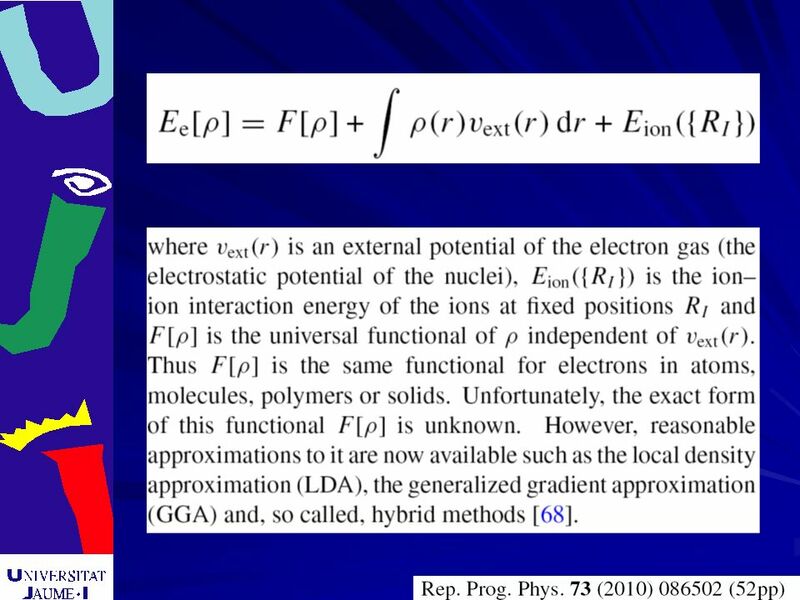 Force Fields, Semiempirical, Plane-Wave pseudpotential calculations. (2 hours) Chapter 4. 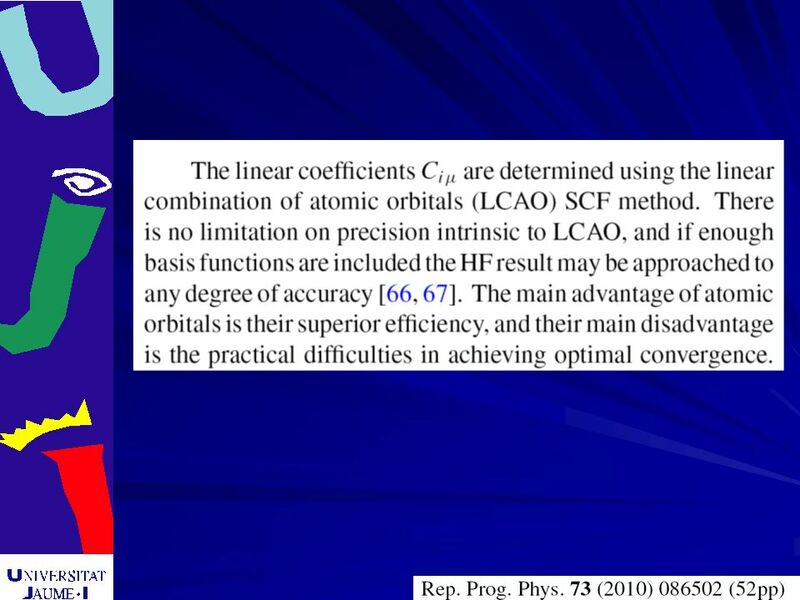 Introduction to Methods and Techniques of Quantum Chemistry, Ab initio methods, and Methods based on Density Functional Theory (DFT). (4 hours) Chapter 5. 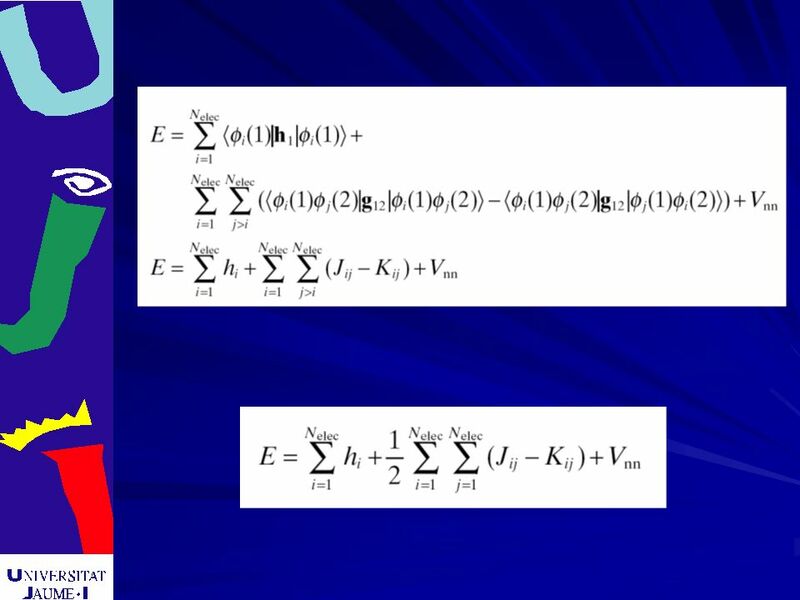 Visualization codes, algorithms and programs. 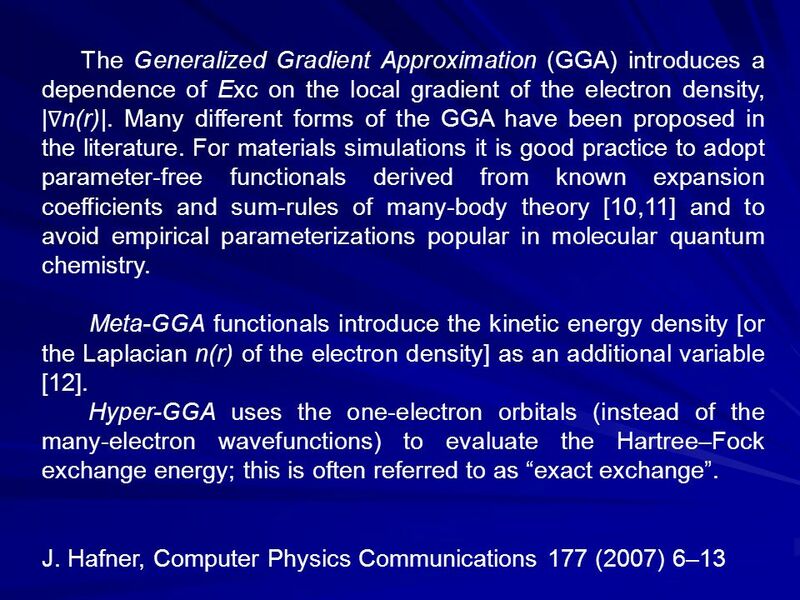 GAUSSIAN; CRYSTAL, and VASP. (6 hours). 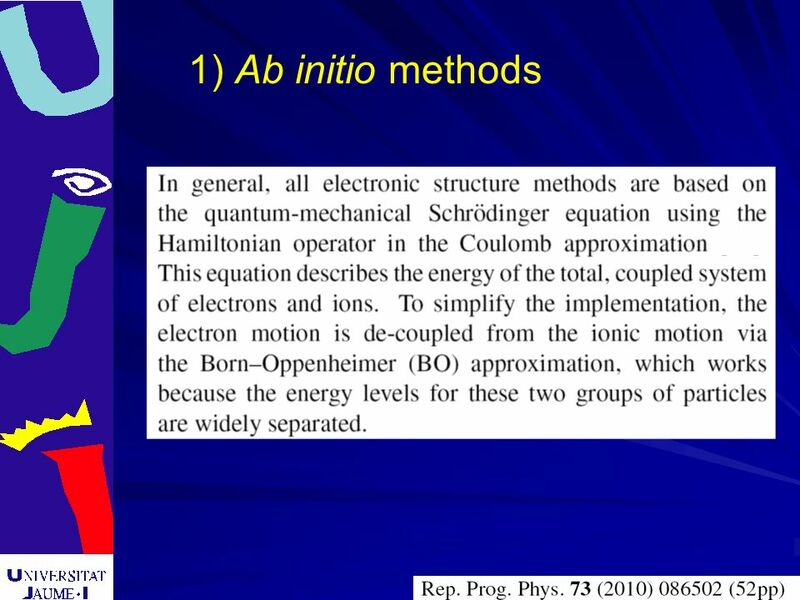 6 1) Ab initio methods. 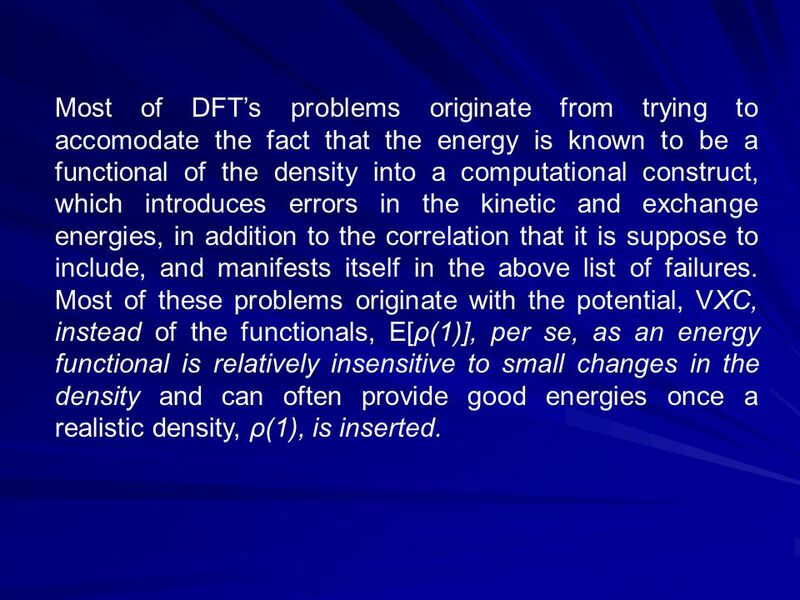 28 Most of DFTs problems originate from trying to accomodate the fact that the energy is known to be a functional of the density into a computational construct, which introduces errors in the kinetic and exchange energies, in addition to the correlation that it is suppose to include, and manifests itself in the above list of failures. 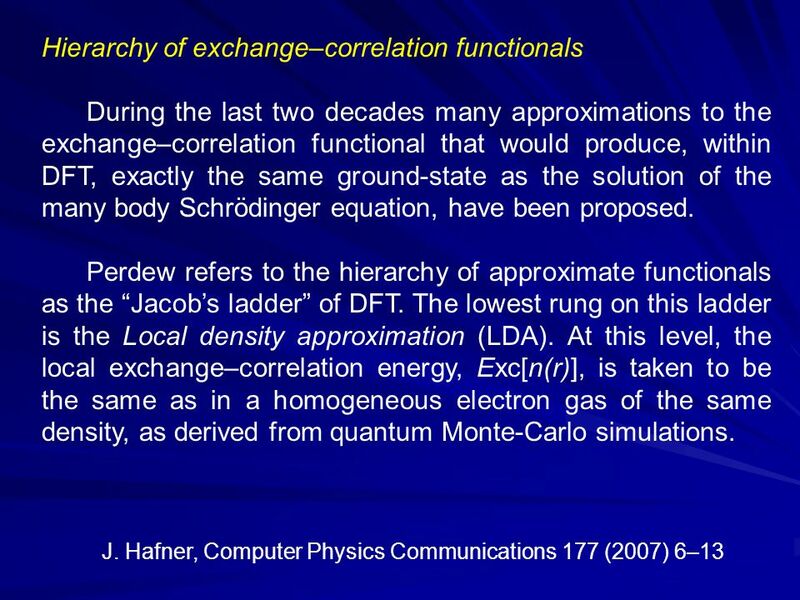 Most of these problems originate with the potential, VXC, instead of the functionals, E[ρ(1)], per se, as an energy functional is relatively insensitive to small changes in the density and can often provide good energies once a realistic density, ρ(1), is inserted. 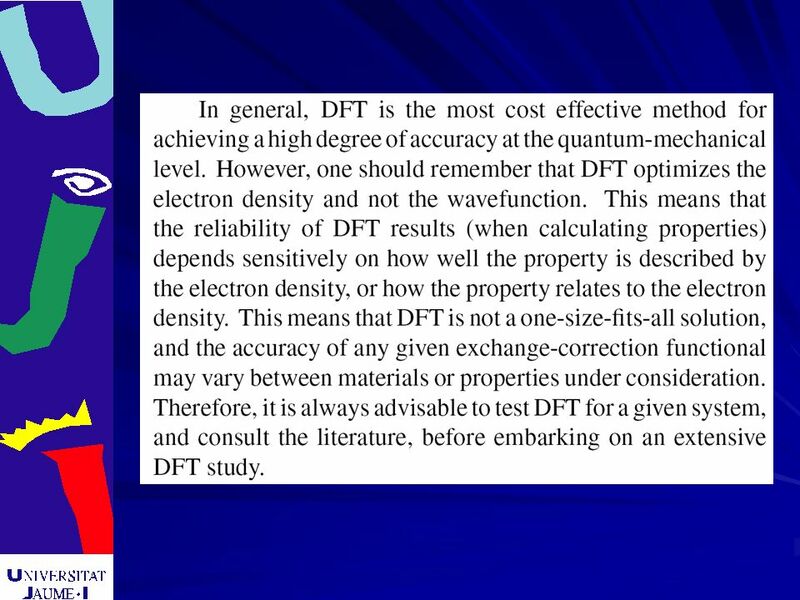 33 Usual DFT calculations actually significantly underestimate the highest occupied molecular orbital lowest unoccupied molecular orbital HOMO- LUMO energy gaps, i.e., band gaps, except for those of metal crystals. 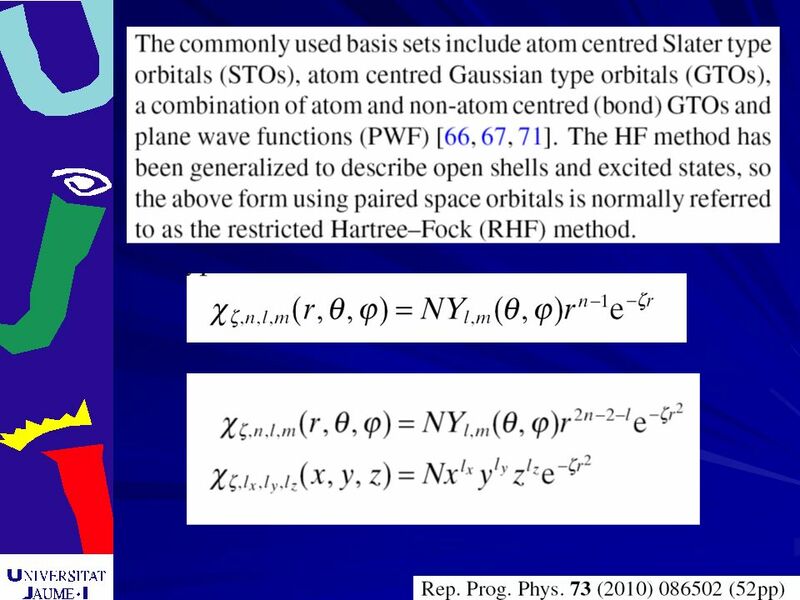 Especially in solid-state physics, many studies have been reported that identify why orbital energy gaps are usually underestimated. 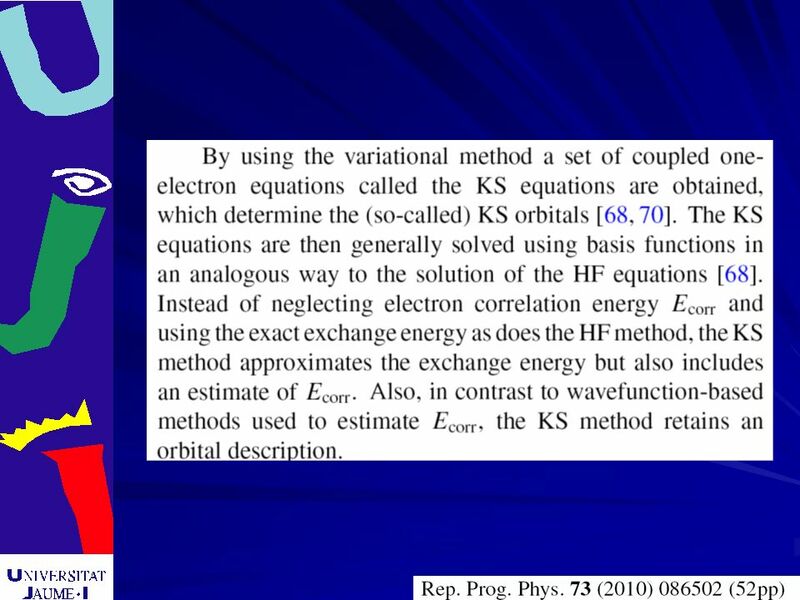 Perdew et al proved that poor orbital energy gaps are attributed to the discontinuity of exchange-correlation potentials. 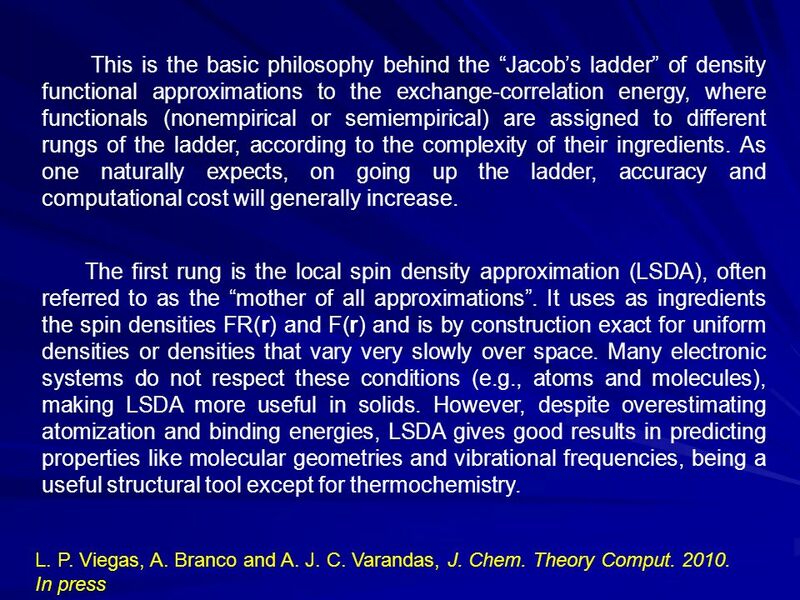 J. P. Perdew, R. G. Parr, M. Levy, and J. L. J. Balduz, Phys. Rev. Lett. 49, 1691 1982. 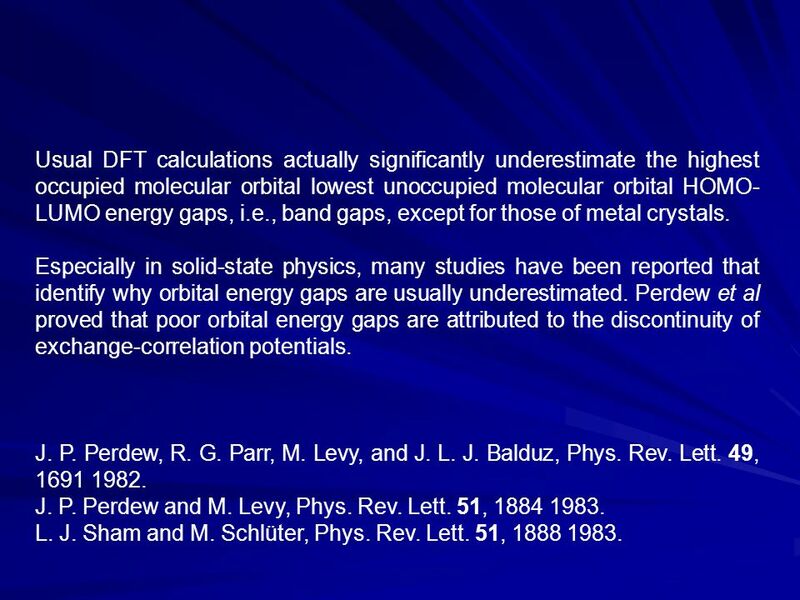 J. P. Perdew and M. Levy, Phys. Rev. Lett. 51, 1884 1983. 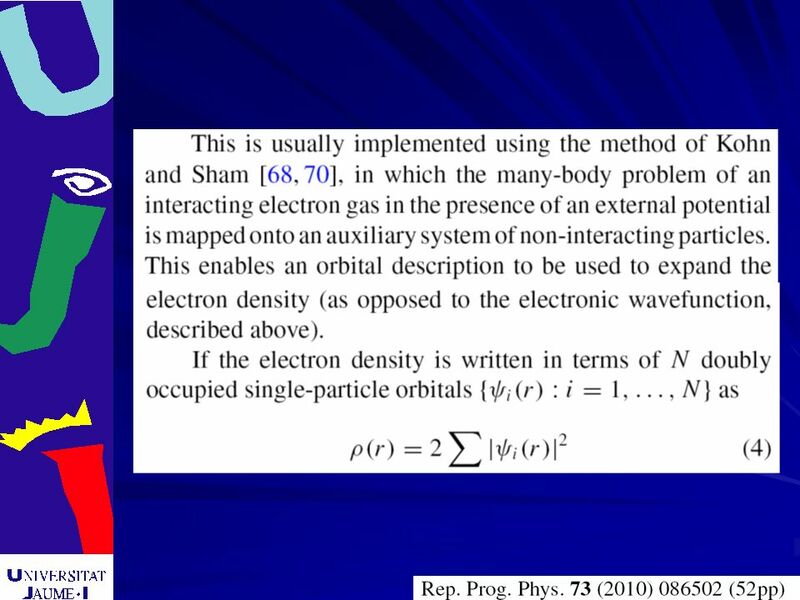 L. J. Sham and M. Schlüter, Phys. Rev. Lett. 51, 1888 1983. Download ppt ". Chapter 1. 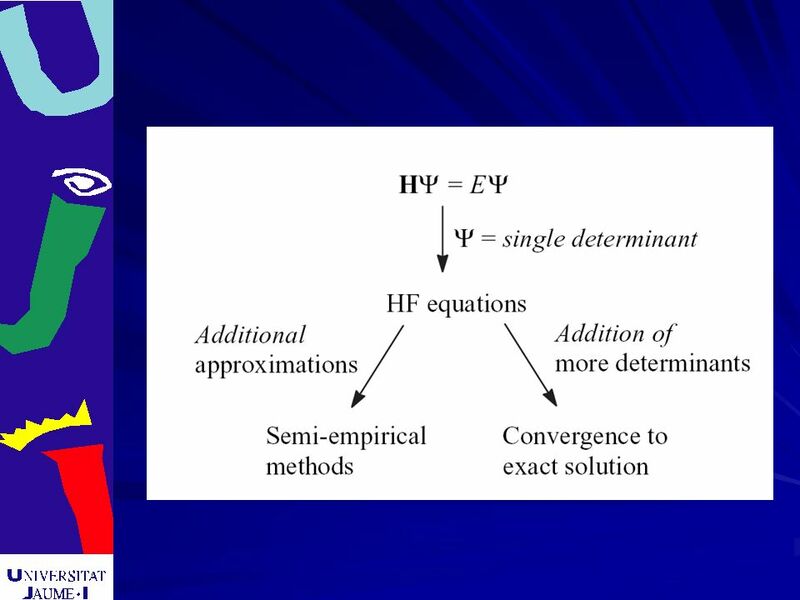 Introduction, perspectives, and aims. 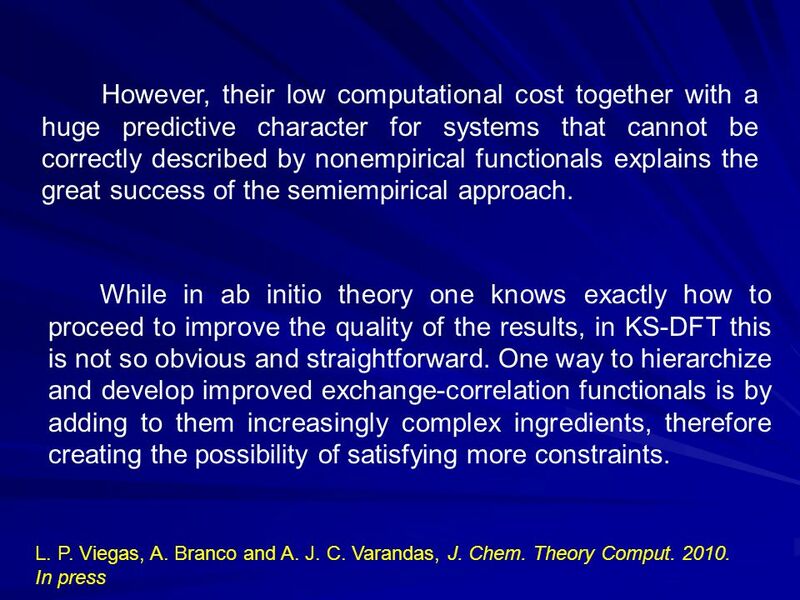 On the science of simulation and modelling. 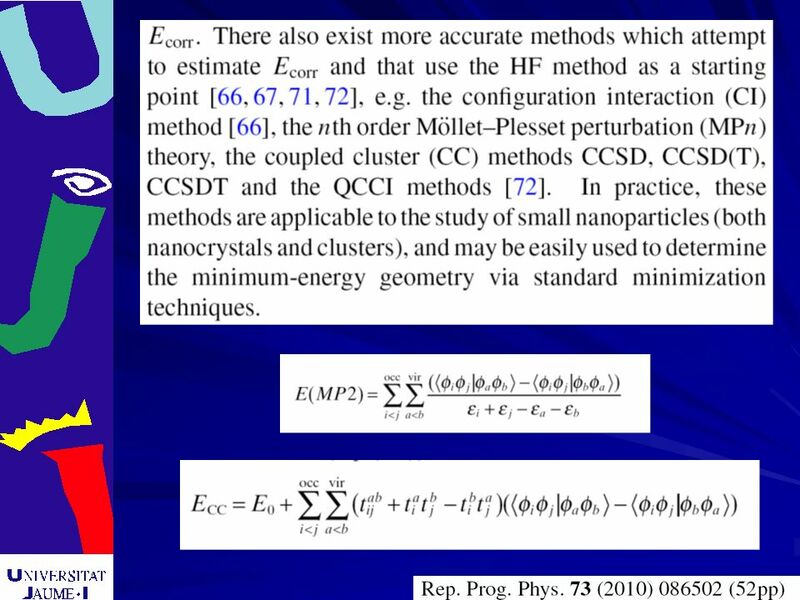 Modelling at bulk, meso, and nano scale. (2 hours). Chapter." 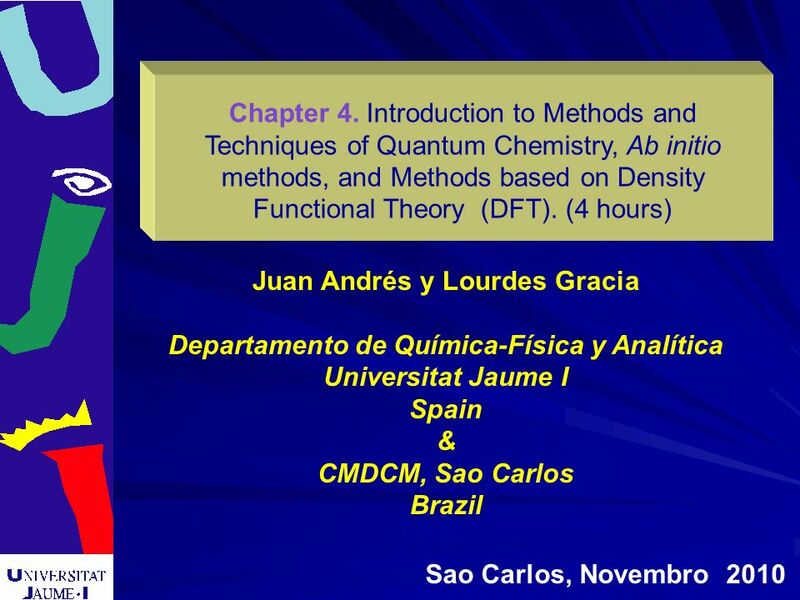 Introduction to Computational Chemistry NSF Computational Nanotechnology and Molecular Engineering Pan-American Advanced Studies Institutes (PASI) Workshop. 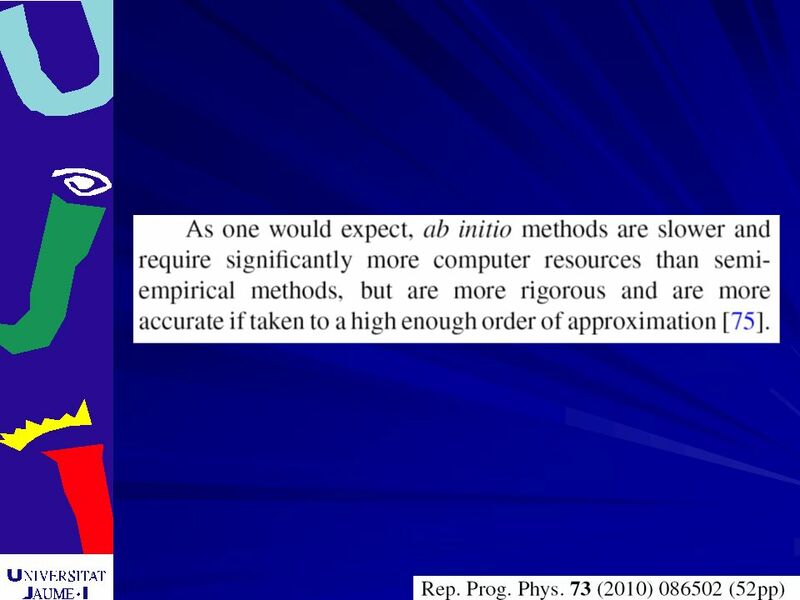 Peter De á k Challenges for ab initio defect modeling. 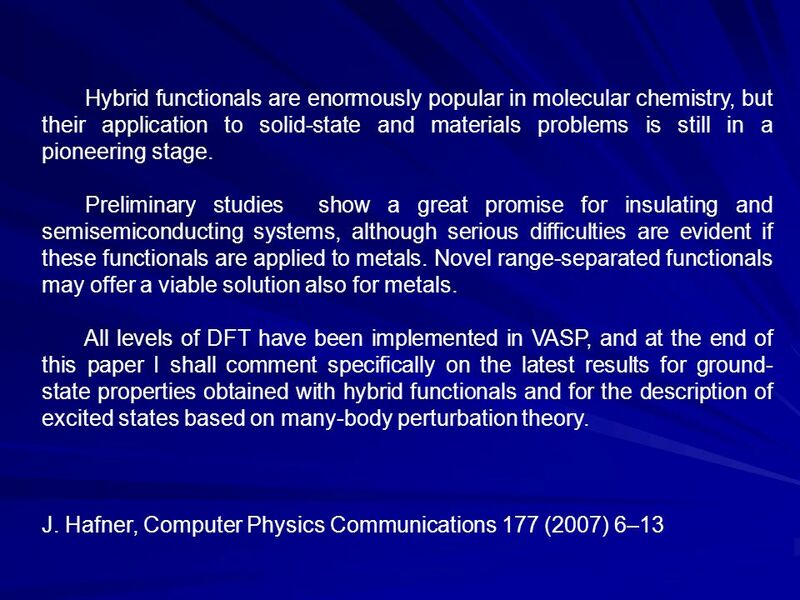 EMRS Symposium I, Challenges for ab initio defect modeling Peter. 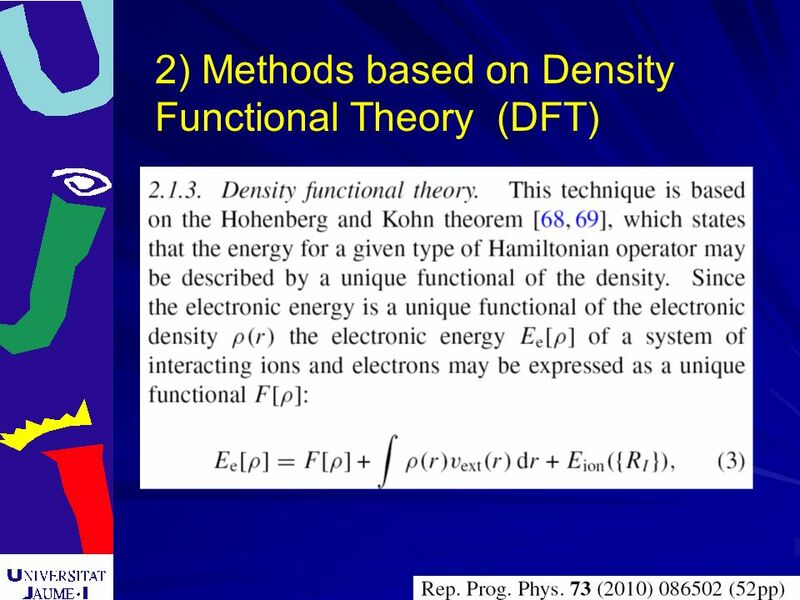 Chemistry 6440 / 7440 Density Functional Theory. 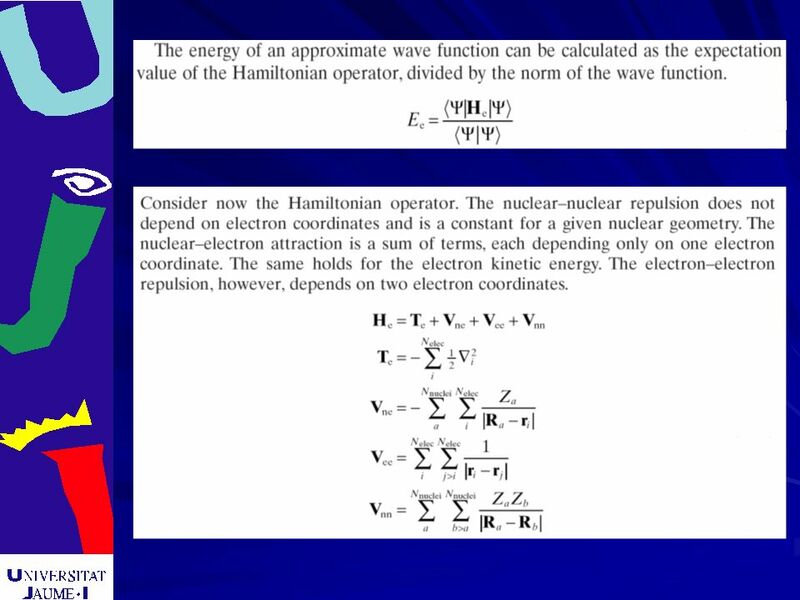 Electronic Energy Components Total electronic energy can be partitioned E = E T + E NE +E J + E X +E. 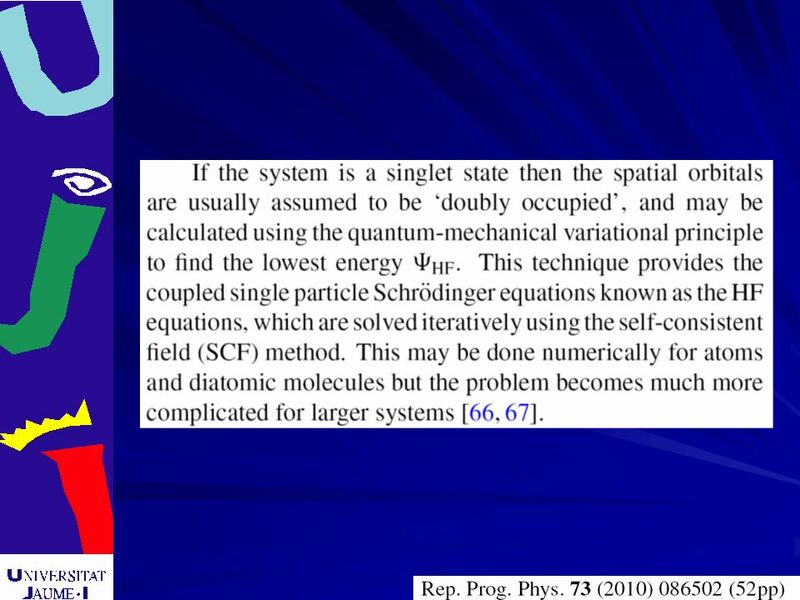 PA4311 Quantum Theory of Solids Quantum Theory of Solids Mervyn Roy (S6) www2.le.ac.uk/departments/physics/people/mervynroy. 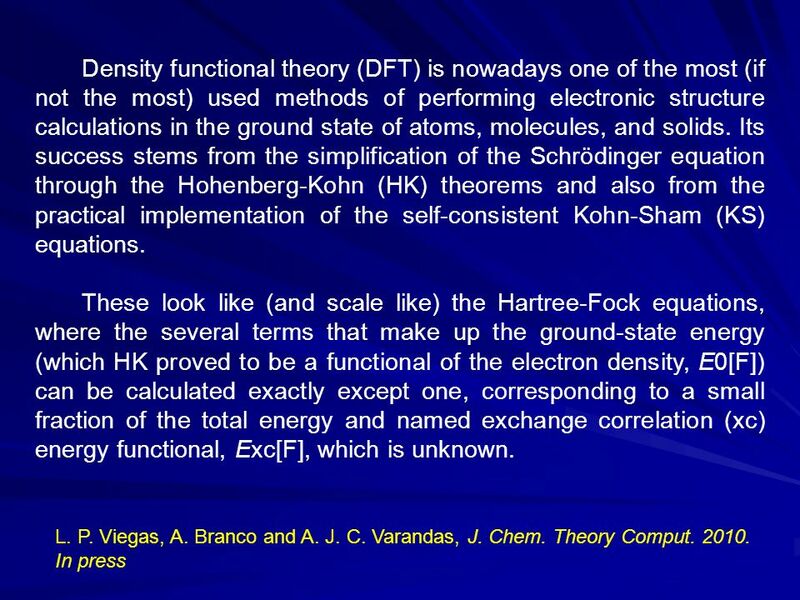 Density Functionals: Basic DFT Theory Sergio Aragon San Francisco State University CalTech PASI January 4-16, 2004. Why? 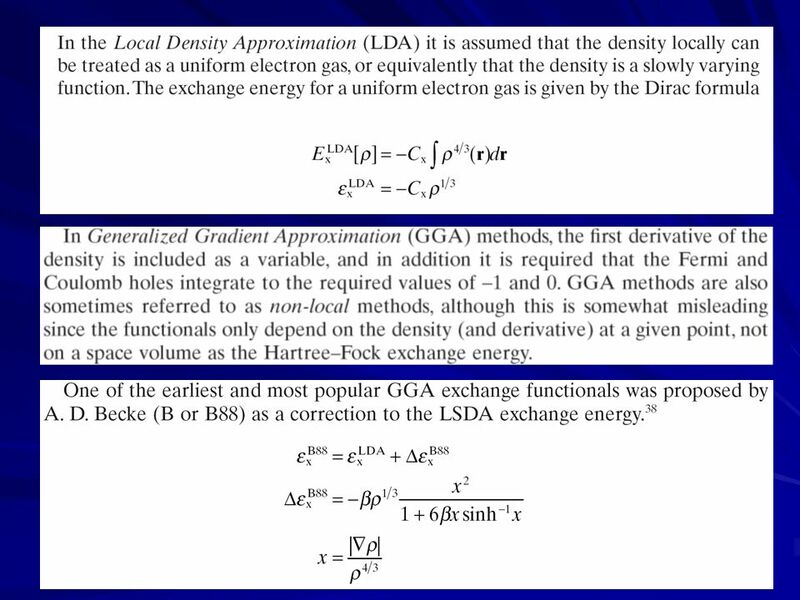 Three options for studying the Earth’s interior 1.Direct observations e.g. 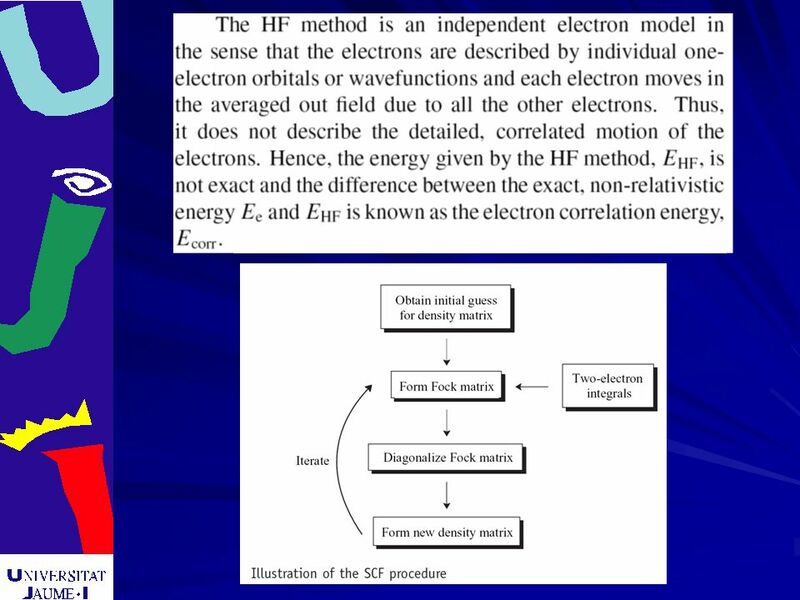 seismics, electrical conductivity 2.High pressure experiments, e.g. multi-anvil.